today’s city guide is devoted to the great city of milwaukee, wisconsin. the guide was written by milwaukee local and author of the blog cream city and sugar, sara yaeggi. sara is walking us through her “beloved” milwaukee’s best spots to eat, shop, site-see and find entertainment, so i hope you’ll enjoy this guide to milwaukee the next time you’re in town. as always, if you have a favorite local spot that’s missing feel free to add it in the comment section below. thanks, sara! *starting next week we’ll be posting some updated city guides. we’ve been working hard to update any and all city guides written before 2009, so stay tuned for an updated brooklyn guide next tuesday! CLICK HERE for the full milwaukee guide after the jump! When I moved to Milwaukee almost ten years ago for college, I only packed one bag because I didn’t think I would be staying very long. I ending up falling in love with this city: the breweries and the lakefront lured me in, but growing culture and diversity kept me here. After I graduated from Marquette, I decided to stay. I found a job, met my fiancé, and moved to Bay View. I started my blog, Cream City and Sugar to post about post-college life: finding your style, decorating, discovering things you can finally afford, and my beloved Milwaukee. Over the last decade a burgeoning restaurant scene has developed with Beard award winning chefs, designer and upscale boutiques have appeared, and local indie music is thriving (Kings Go Forth, Decibully, Maritime). The old stereotypes of a dull, blue collar, beer drinking, bratwurst-eating city are changing, and when visitors come to Milwaukee, they start to fall in love with it like I did. I’ve heard it described as “Portland with more beer”. It’s true: our beer culture is strong and the roots are deep. Milwaukee is known as the “beer capital of the U.S.” and the names Miller, Pabst, Schiltz, and Blatz are like members of our family, but you find can also find new names like Leinenkugels, New Glarus, and Tyranena. If you visit, come in the summer. The winters are harsh and people tend to hibernate. But, in the summer, the city comes alive with festivals and block parties every weekend. Milwaukee is becoming more bike-friendly, but it is still best accessible by car. Amtrak’s Hiawatha route runs regularly back and forth from Chicago. Gen. Mitchell International Airport is located just south of the city and an easy 15 minute cab ride to downtown. To check out the local happenings, grab a Shepherd Express paper or log onto onmilwaukee.com. MAM: The gem of the city, the architectural wings open in the morning and close at night. Haggery Museum of Art: Walk through the Marquette University campus, check out the Joan of Arc Chapel nearby. Fred: Fun, stylish, reasonably priced fashion. Limited stock means guaranteed unique pieces. Pabst Theater: Indie artists almost every night, insanely breath-taking historic theater, $3 PBR tallboys. Lakefront Brewery: The best brewery tour, great beer, legendary Wisconsin fish fry. Alterra on the Lake: There are many Alterras in Milwaukee, but this one is everyone’s favorite. Bacchus: Upscale but the food is worth the splurge. Roots: Organic and local food, perched on a bluff with a great view of the city. LIVE LIKE A LOCAL: MAM after Dark, Summerfest. Jazz in the Park. Take the Riverwalk. And pay your parking meter, or else. The Home Market: Simple yet chic home goods, furniture, and décor with an upscale flea market feel. This is my favorite store in Milwaukee (my checkbook will tell you so) . Freckle Face: The cutest kids clothes you ever will see. Hot*Pop: Art and design boutique and gallery. Clothes and fun stuff that is young, bright, and modern. Eisner Museum: Advertising and Design museum. Explore advertising’s influence on American culture. Near Milwaukee Institute of Design. Broadway Paper: Stationery, greeting cards, invitations, gift wrap, and handmade paper. Katie Gingrass Gallery: A contemporary fine art gallery with regular exhibits. Lela: Wearable fashion that’s moderately priced and has great style. Coquette: Traditional and classic Parisian cafe with white table cloths and excellent service. Multiple Beard award winning chef, Sandy D’Amato prepares the most delicious food. Milwaukee Public Market: 20 local vendors selling fresh food, flowers, spices. St. Paul Fish Co. serves a good lunch. Hinterland: Gastropub with wild game, gourmet ingredients. Wicked Hop: Bloody Mary’s , beer, food, and a social hotspot. Milwaukee Ale House: Great beer and a riverfront patio. Optix: Even if you’re not in the market for new glasses, check out all the crazy yet gorgeous styles. Utrecht Art Supplies: Big and small art supplies. Oriental Theater: Indie and mainstream movies. Incredible and historic 1920’s movie palace with plenty of gilded ceilings and red carpets. Detour / Ma Jolie / Miss Groove: Top shelf clothing stores for the fashion savvy trend-seekers. Comet: Rock and Roll greasy comfort food. Beans & Barley: The best choice for vegan, vegetarian, or organic eaters. Deli and market for to-go eats. Trocadero: Always voted best brunch. Nice big patio. Modern french feel. Good for large groups and hangover drinks. Balzac : Wine bar tucked away just off Brady St. Small menu with cheese and appetizers. The Garage: Next door to HiHat, a nice hangout with great music under a canopy of large trees and branches. Nomad: Like a world traveler’s attic. Souvenirs and beers from all around the world. LIVE LIKE A LOCAL: Ride your bike, shop for groceries at Glorioso’s Italian Foods, have a late night snack from the Pepperoni/Cannoli guy. Sparrow Collective: Local designers, handcrafted accessories. Rush Mor Records: Old School record store with hard to find CD’s and Vinyl. Tip Top Atomic Shop: Retro and mid-century modern paradise. Honey Pie: Laden with heavy cheese sauce and Wisco-pride, this hotspot caters to hipsters and blue-haired ladies alike. Palomino: Rockabilly roadside fare with plenty of vegan options to boot. Café Lulu: A neighborhood fixture. Kitschy and cool. Highbury Pub: British beers and British soccer. Sugar Maple: A craft beer mecca for beer drinkers that know the difference between a porter vs. a bock. Burnhearts: Tucked away between houses, this tavern has a hip vibe, great beer, and impeccable music. Clinton Street Antiques: An edited mix of eclectic and unique. Fox Skylight Gallery Antiques: Large and vast like an indoor flea market. Fashion Ninja: Indie fashion with a couture look. Walker’s Point Center for the Arts: Avant garde visual and performing arts center. Brass Light Gallery: Amazing handcrafted Arts & Crafts style lighting for residential or commercial. Harley Davidson Museum: Find out about Harley’s history from WWI to weekend warriors. La Merenda: Tapas from around the world. My personal favorite is the Sambul Goreng Udang. The National: Coffee, sandwiches, beer– all local and sustainable. Soup Bros: The maker of these fine, hearty broths and stews is better known as the “soup nazi”. Dining area is decorated with an incredibly eclectic mix of ephemera, artwork, and personal belongings. Bryant’s: A genuine 50’s lounge with black velvet walls, Brandy Alexanders, and Frank Sinatra music. Moct: Renovated warehouse garage turned DJ driven night club. LIVE LIKE A LOCAL: South 2st St. is a largely LGBT district. The pride parade marches through the street every year as part of Pride Fest. Re-threads: Nicely edited thrift store that still has great prices. Loop: Yarn supply and knitting store. Project M: Men’s and women’s clothing all made by local designers. Fuel Café: Aimed towards gearheads, grunge rockers, and coffee drinkers. Nessum Dorma: Menu of Panini, bruschetta, and antipasti set in an old storefront. Stonefly Brewery: Gritty and dark, but staff is friendly, and they brew their own beer. LIVE LIKE A LOCAL: See some live bands at Mad Planet or dance at the Get-Down. See motorcycles and scooters at Rockerbox in August. Walk the trails around the Urban Ecology Center. Woot!! Great guide! Milwaukee does ROCK. Thanks for the spotlight, D*S!! You forgot Maria’s Pizza! Located about 10 minutes from Miller Park near S. 51st street, this place is truly a gem. I was raised on this ‘za and it’s the best thin crust you’ll find anywhere. The inside is very cozy. It’s decorated from the floor to ceiling with religious ‘paint-by-numbers’ type painting and decor for whatever holiday is next on the calander. Check out the link below for an awesome review and pics! I love Milwaukee. Off the map for some reason, but it’s such a great town. Like Chicago, but cooler! Nice job summing up Mil-town in all its glory! We probably were at Marquette around the same time! One thing I would add is to take a stroll down the Riverwalk, stop for a pint on the Harp’s patio, and meander down to the lakefront to check out the lake and marina along Veteran’s Park. Gorgeous! Yay for Milwaukee! Spent my formative years there and I miss it! My husband and I got married at Villa Terrace and had our reception in the 3rd Ward. all of our guests were very impressed with how unassuming and amazing Milwaukee is. Glad Beans and Barley made the cut – my favorite! Only thing missing is Kopp’s Custard! I was expecting same ol same ol, when I saw you were featuring my home town this morning! Great guide to a artsy little midwestern city. We’re in Bay View as well and we LOVE this city. It was great to read about all the places we’ve never been! FYI, a majority of the links are messed up. Aw yeah! I grew up in WI and lived in the Bay View neighborhood for a couple years, and definitely second the recommendations on Lulu and Palomino. Both are THE BEST. Good times, MKE, good times. Can anyone suggest some good places to stay? Thanks! Great guide! Also, Milwaukee is becoming the country’s epicenter of Urban Farming. Please check out http://www.growingpower.org and http://sweetwater-organic.com/blog/ for some really great things going on in the city! They are both must-visits for residents and non-residents alike. Hooray! There is even more to Milwaukee than you could list here – I would add Cafe Centro in Riverwest for a romantic dinner and Art Bar (Riverwest) for the best bloody mary in town. I would also challenge visitors to find Barnacle Buds for the best summer atmosphere off the beaten path. I won’t tell you where it is, but if you find it you will not be disappointed. Milwaukee love! My husband and I visit Milwaukee at least once a summer (it’s about 2 hours from here). It’s nice to have a local’s perspective and input on what to check out, thanks!!! I will bookmark and use this post for years to come. I grew up just outside of Milwaukee and miss it terribly! I’ve brought several friends back to see MKE and they are always surprised and amazed by the awesome, friendly yet cultured city. Visitors, be sure to sample some frozen custard (Kopp’s is best, but Bella’s Fat Cat has a Brady St location) and fresh squeaky cheese curds! Great compilation – you got all of the best Milwaukee sites I can think of! thanks for this guide! milwaukee is a great place to visit (and live). Kopp’s by far has the best frozen custard. If you are there in the summer, see if the flea market is going on in Cedarburg. A fun Wisconsin experience. Brats and beer at 6 am on a Sunday morning. I just thought of something else to add to your list: Landmark Lanes, which is right beside the Oriental Theatre on the East Side. It features 3 excellent bars with amazing beer specials ($2 Spotted Cow? Yes please!) and bowling, as well as darts and billiards. The only problem with Milwaukee pubs is the smoke…is it going smoke-free anytime soon? Oh, also, walking down the breakwater/pier by McKinley Marina can be slightly buggy but offers a nice view of Milwaukee, plus it’s fun to climb around on the rocks at the end. There are many others but these are the ones I would recommend to friends coming to visit. Yay Milwaukee! Comet is so great! No sure if they still do it, but they use to have PBR / Beard specials. Yep, if you have a beard you get a $1 “tall boy” of PBR. Not to mention the baskets of bacon. Great brunch too. we moved to milwaukee two years ago, and could not be happier with this well kept secret. i love living on the east side and walking to the other neighborhoods. it’s all of the benefits of living in a city, but with the pace of a small town. thanks for this guide! Emily: i’m pretty sure milwaukee is going smoke-free at some point this year. Adam, I was going to mention the Comet Cafe too. I believe they still have Bacon Happy Hour! Actually, I think Freckle Face may already be closed. It looked like it last weekend when I walked by. I can’t believe no one has mentioned the Bronze Fonz statue yet! OMG! How could you forget Sprecher–marvelous root beer who’s soda sales support explorations in micro brew beers. Less than $5 tours and free Sprecher soda for the kiddies. Milwaukee is supposed to go smoke free this summer! YAY! It’s not quite Chicago, but it is a great town! Perfect timing! We just booked tickets there for a wedding in June. We were going to go to Chicago on Friday but now we’re definitely staying in the city! If you like victorian decor, i’d also suggest a stop at the Pabst Mansion on Wisconsin Ave. Absolutely beautiful. I lived in Milwaukee for four years and miss the good food and BEER. Please check out North Star American Bistro. It’s a local restaurant with locations in Shorewood and Brookfield. Wonderful food with a casual yet sophisticated vibe. Hooray! I’ve been living in Milwaukee for the past 3.5 years. It’s a great town, I’m so happy to see it featured here. Too many places I haven’t discovered yet. I live in NYC now, but return to MKE at least 2-4 x/year. Love it! If you’re looking for stylish digs stay at the Iron Horse in the 5th Ward or, if you want to be downtown stay at either the Intercontinental Hotel (be sure to get a room facing Water St) or the Pfister. For a romantic dinner w/a view I’d recommend Roots. Tea at either Watts or BLU (in the Pfister). I am so happy someone mentioned safehouse. it is thee coolest bar i have ever been to. the MAM, designed by Calatrava is breathtaking. Growing Power farm is amazing. They are so friendly. I volunteered for a week and learned so much. what a great city to visit!! I’ve been waiting for a MKE design guide. Great job! Freckle Face is already closed, but Sprout! across the street is also a cute kids’ store. The Eisner Museum will soon be virtual only…hope something else makes use of that great space. The only thing I would add, is for real Milwaukee kitsch, a cocktail at the At Random lounge is a must. We’ve brought everyone from our grandmas to our Park Slope hipster friends there and it’s always a hit. Safe House is great….sorry it didn’t make the list. Also, go for an alcoholic ice cream sundae at this super fun retro place- At Random. Bosley on Brady has a great happy hour during the week, but get there early because it gets pretty crowded. Also Lucille’s on Old World Third Street is a really fun dueling piano bar. Mader’s is an authentic German restaurant also on Old World Third that is really good. The Miller Brewering company also gives a pretty good tour that I believe is free. Coast is pretty good too-almost tapas like. If you are on the East Side looking for really good Indian food – Maharaja! I have lived here for a year and a half and have loved it! I’d like to put in a word for Cempazuchi for delicious Mexican food* and the Circle-A for being the best bar EVER. If you go say hi to Warwick for me! I am so happy my baby MKE finally got a guide! Don’t forget the Miller tour – totally mainstream, but free. Also, Sobelmans’ and Tallgrass Cafe – Awesome Burgers! Sobelman’s is the original and Tallgrass is the organic take. Yum. Three Brothers on the south side. Authentic, delicious, Serbian food in a landmark Schlitz tavern. The Friday fish fry at Turner Hall. And Sollie’s, since 1936, home of the original butter burger. Milwaukee is certainly underestimated! It is such a great city; a great mix of history and progression. I’m so glad to see that Beans and Barley made the guide. Although I moved out of the city, B&B remains my favorite restaurant of all time. I feel Milwaukee calling me these days… hoping to move back within the next year! I’ll be happy to visit some of the guide’s recommendations that I have yet to try. i knew i loved your blog for a reason (other than it’s uber-coolness)…this is great! thanks for showcasing our small BIG city. I squealed when I saw this. The first time I went to Milwaukee was in January and I’ve been back twice since. It is an amazingly diverse and friendly town. Also, it’s probably the most vegan friendly place I have ever been. Love love love LOVE it. Milwaukee is misspelled in the opening paragraph. Amtrak does not own the airport as you imply when you call is Amtrak’s General Mitchell International Airport. Trocadero is closed for at least a month and someone mentioned Bella’s Fat Cat – the Brady Street location closed a year ago and the Oakland location is closing. Thanks for this. I just booked a trip here and it couldn’t have come at a more perfect time. BTW, a lot of the links are not working. Yay! So happy to finally see a Milwaukee guide. I’ve lived here for almost 12 years yet still hear about new places on a fairly regular basis. For anyone considering a move here, the cost of living is pretty cheap and there are some amazingly beautiful old homes by the lakeshore (& within the city too) to gawk at! Definitely worth a walk or drive along Lake Drive and the surrounding neighborhoods. Awesome! So excited to see a Milwaukee post here! I love this guide to Milwaukee! As a Bayview resident myself, I would include the awesome Cafe Centraal and Tonic in Bayview for a cool place to get a drink. I would also highly recommend Stone Creek Coffee! Yay Milwaukee! As a Milwaukee girl for going on seven years now (I came for undergrad, stayed for my Masters and never left…)… All the recommendations above stand. I’d like to add that for the best bar trivia in town (seriously), check out Charlie’s in the Third Ward. Also, one of the BEST (and least known) restaurants in town is Crazy Water. Their kitchen is smaller than many closets… and the food, wine and service are impeccable. As a life long Milwaukee girl, this guide is much appreciated. Great blog! Can’t wait to read more. Thanks for sharing. Congrats, Sara!!! This is a great guide! Thanks for the MKE guide. Our first visit to Milwaukee was such a pleasant surprise, not at all what we expected. Thanks for all the great links. Will definitely put them on my To-Do list, but it looks like some of them need to be done rather quickly. I will add my two cents of visiting Third Ward Jewelry also in the Katie Gingrass Gallery. After looking through the city guides this week planning spring break ,I noticed Milwaukee was not listed yet so I’m excited to see this post! I’ve lived here the last 6 years. There’s so much to do here. Another restaurant is Hotch-A-Do on North by Beans and Barley. They have vegetarian options and a shuffle board! It’s a cute place for brunch. Most the other posts were spot on..
I’ve lived here for 22 years. This is a fantastic guide and shows how incredible the city really is! 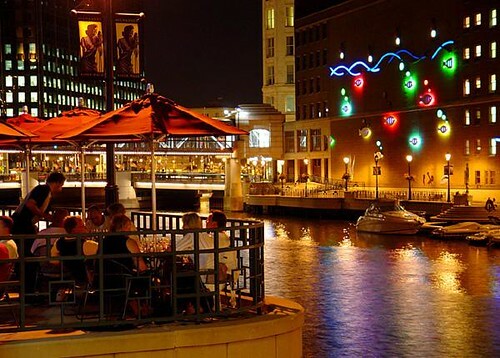 The city of Milwaukee is truly a gem, most people are surprised at all it has to offer! Milwaukee sometimes gets pushed aside compared to Chicago, but the East Side of Mil-Town is definitely a diamond in the rough! :) Come visit!! I’ve been in Madison for a couple of years, but I’ve never seen more of Milwaukee than the airport. I’m packing my bag for a weekend get away! Yay Milwaukee!! It is a great town to be in, and proud to call it home for 20 years. I agree with all of Sara’s call outs to visit/taste/see. Thank you featuring our wonderful town D*S! Love the Home Market!! Also forgot to mention the King and I for THE BEST Thai food downtown, close to Grand Ave Mall on Wisconsin. I have to give a shout out to the best radio station in the world . . . RADIO MILWAUKEE 88.9. I’ve lived in Milwaukee for a dozen years and I love this city. If I left, this is what I would miss the most. Radio Milwaukee is more than radio, it is a movement. It is changing our mindset, changing our culture and breeding incredible local, independent music and culture. You forgot Pizza Shuttle!!!!!!!!! I LOVE Pizza Shuttle on Farwell! You forgot Cafe Hollander on the East Side! Guys will love the beer menu and the atmosphere is amazing! I know it’s in Wauwatosa, but Balistreri’s on 68th St. has the BEST Pizza! (And fried eggplant) Mmmm. It’s a great site to find a fish fry in Milwaukee, Waukesha, Ozaukee, Washington, Racine or Kenosha counties, over 550 in all! Someone mentioned Milwaukee’s distillery -Great Lakes Distillery’s wonderful vodka and Gin, but we stopped this past weekend for their tour. Highly recommend it- we had a blast, tiny distillery and a bunch of great spirits- (they make a lot more than vodka and gin). It’s right across from the Iron Horse, a great boutique hotel where we were staying. Be sure to check out Elsa’s on the Park at 833 N. Jefferson St. Whenever I visit Mil town, that’s where I stop for a bite. How can we forget Glorioso’s and Sciortino’s on Brady Street for fantastic Italian food?? We love your blog over at project m.
I was just wondering if you could please update our site on your guide! Thanks! Thanks for a great guide! I am moving to Milwaukee in less than a week and am super excited to get to know the city. Just wanted to let you know that my wife and I went up to Milwaukee from Chicago last weekend and used this post as a personal tour guide from our phone. Thanks! YAYYY MILWAUKEE!! I’m from there and there is a place worth going to called Hong Thai on Greenfield in West Allis…hands down THE BEST thai food ever. Will change your life. Order ladna ma mee (don’t know correct spelling). It is amazing! Hey! Looks like an update is needed! I’d be willing to work on one for you. I’m one of the owners of Sparrow Collective in Bay View Milwaukee. Over the past few years we have added sooo many new establishments to not just Bay View but all over… I’d love to help spread the news! Milwaukee is such a great place but it’s definitely has it’s hidden gems! These are a lot of great ideas for things to see and do while in Milwaukee. Thank you for the information! Great Milwaukee guide! So much to do/see!